The online world of business is often tied to a companies web presence and real estate is no different. As Realtors, we are in the business of selling physical space, but often our largest business asset is the internet space we own, not an actual brick and mortar business. Technology has changed the way people search for businesses. It is estimated 90% of people searching for a home or Realtor begin their search online. At HomeToIndy, we are expanding our search capability and our internet presence to offer home buyers and sellers more information about real estate in Indianapolis. HomeToIndy.com has acquired the internet space and website of My317Home.com. If you came here looking for My317Home, you'll find the same great information, even though our home search is a bit different. The combination of the two sites will provide visitors and clients to HomeToIndy.com access to in-depth information about the real estate process, property details, mortgage calculators and many helpful real estate related tools. Our resource for buyers and sellers is packed full of information about financing, foreclosures, short sales, tax information, tips for selling your home, first time homebuyers and real estate market reports. Our dynamic search for homes in the cities, towns, subdivisions and communities of Indianapolis provides detailed information for every home, including room sizes, type of flooring, HOA fees, taxes and much more. You'll find multiple maps and a list of neighborhood amenities. including parks, shopping and schools. Discover the neighborhoods around the home you are interested in. Check out how the school in the area ranks when compared to other nearby schools, as well as where the closest park or shopping center is. Our real estate search platform allows you to find the best home to meet your needs in Central Indiana. Go beyond the basic search of number of bedrooms and bathrooms to locate homes in Indianapolis with the features you want. Advanced search capabilities help you find homes with a basement, acreage or large yard, neighborhood amenities, golf course homes or homes with a swimming pool. 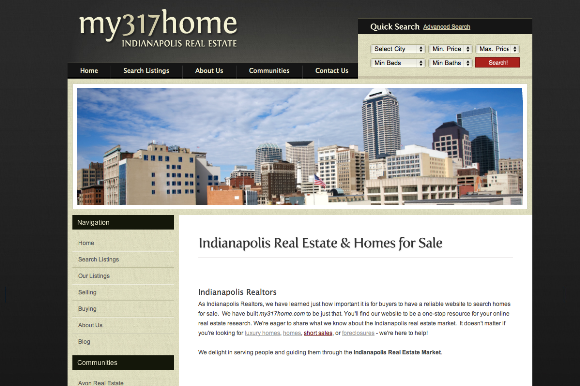 My317Home.com will no longer exist, but to honor my friend and his hard work, I have saved a copy here for posterity. Of course the image doesn't do the site justice. Congratulations Paula! Your site will do it justice I'm sure, you have a lot of great information and an excellent home search. To your success!